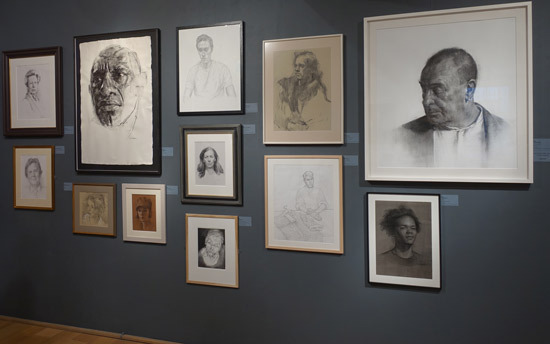 I'm going to split my review of the annual exhibition of the Royal Society of Portrait Painters into two halves. There is a list of all the events during the course of the exhibition on the RSPP website - with more details on the Malleries site. Most of them cost nothing. Five of the six prizewinners came from the Open Entry - which is very strong for this exhibition. More about this in my next post. A Portrait of Roger Scruton by Lantian D.
This year's winner is Lantian D. Her subject is Roger Scruton who is a writer who is currently a Senior Fellow of the Ethics and Public Policy Center, a visiting professor in the philosophy department at Oxford University and is leading a Masters Degree in Philosophy at the University of Buckingham. He has specialised in aesthetics throughout his career. What's just as fascinating is the story of the development of the artist as a painter. Lantian D is a self-taught artist. She followed a strict and traditional education in China and did a commerce degree to keep her parents happy. In 2008 she then studied media arts and film production at the University of Technology, Sydney. She then went on to work in galleries in Sydney and London, became acquainted with the contemporary art scene - and rejected it and studied Chinese art history at the School of Oriental and African Studies. Today, traditions of craft and the pursuit of beauty have long been forsaken by much of the art world. Postmodern Art, which appears to have been initiated by Duchamp and capitalised on by Warhol (and so on), no longer makes sense to an “un-indoctrinated” eye. The Avant-garde of the 20th century finally got more than what they bargained for. Look around: insipid jokes, flippant kitsch, hollow attitudes, juvenile anger, nauseating shocks, bewildering objects and shameless plagiarism are the daily diet of the art industry. This is a photo of the painter with the subject - Roger Scruton. I'd have loved to have been there to photograph artist with model but alas "The Knee" was back in the knee brace and not keen on the scrum which is the RSPP Awards Ceremony. 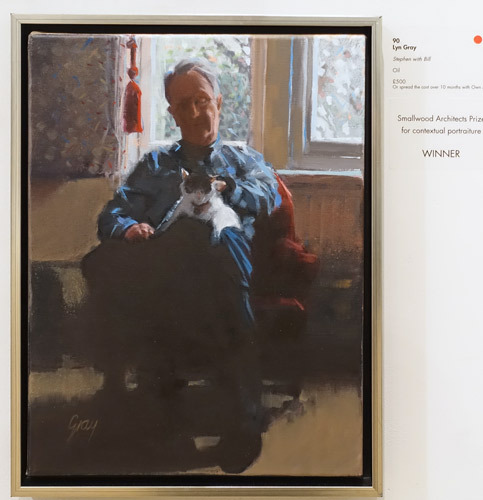 Purpose: a prize for an artist under thirty five years old judged to have submitted the best portrait. sponsored by the de Laszlo Foundation which aims to encourage young artists. Stephanie Kullberg is from Gothenberg in Sweden. She has studied at The Florence Academy of Art where she also worked as a teaching assistant. This is her Instagram account which includes a lot of her portrait paintings. I think she's having a problem with her website at the moment as it came up blank. 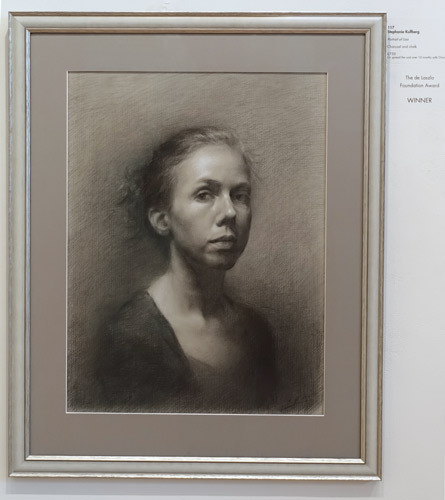 awarded to the artist whose portrait best conveys the energy of their subject, the directness of their gaze and an attitude that exudes openness and confidence. Sponsored by Changing Faces who have been campaigning for face equality since 1992. The Changing Faces Collection aims to show the public that a person’s distinctive scar colourful mark or unusual feature is just one part of their overall picture. 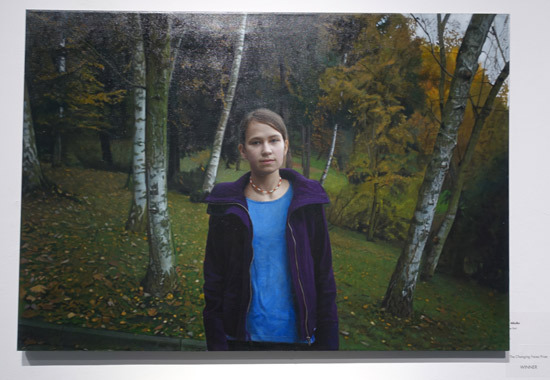 The winner is Czech artist Jan Mikulka who won the self portrait prize in 2013. 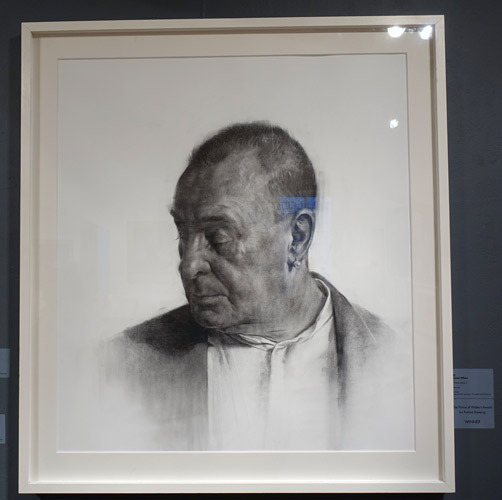 Jan Mikulka wins £20,000 SELF Portrait Prize. This portrait seems to have been painted in the same location as his entry in the 2015 BP Portrait exhibition. Prize: £2,000 and a framed certificate. supports the importance of good grounding in the skills of drawing from life. One of the rather nice things about the RSPP Annual Exhibition is the quantity of very good drawing that is included in the exhibition. This has undoubtedly been prompted in part by the fact that this Society Awards includes a Drawing Prize - and not just any old drawing prize but one sponsored by the Prince of Wales! The winner this year is the Scottish artist Graeme Wilcox. He attended Glasgow School of Art and graduated with a first degree in Fine Art in Printmaking. He is currently based at the WASPS Southblock Studios in Glasgow and has been a consistent winner of awards in recent years. He has another painting in the Corpus Exhibition which opens at the Blackheath Gallery tomorrow. The Winner is Richard Foster RP. He is a former Vice President of the RSPP and has had a number of notable commissions. 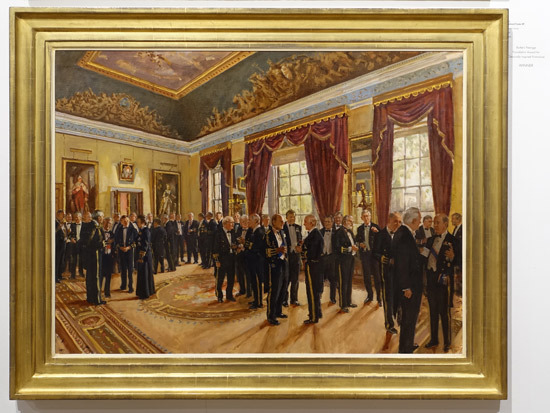 This portrait includes a portrait of the Duke of Edinburgh in the middle of the picture and Princess Anne towards the left. This is a photo of the artist with the painting. The winner of this backlit portrait is Lyn Grey. No website that I could find so I don't know anything about the artist. Thanks so much for this kind and well-written article. I'm flattered. By the way, the animal is a donkey! I told Roger once that I nicknamed this donkey “Donkey Hottie”(homophonic to Don Quixote). Though I’ve never finished the famous novel, not even when reading in my mother tongue (Chinese), the main character intrigues me: a man tries to become a knight when the age of chivalry has long gone. Cervantes says Don Quiote dies in disillusion, while some modern readers believe that he actually becomes a knight in the end. Furthermore, Watteau’s Pierrot was also an inspiration when composing this portrait. 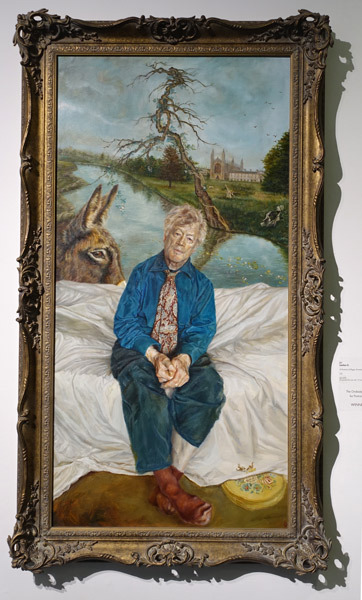 When I first showed Roger Scruton the portrait, he did mention that he would prefer a horse to the Donkey (and he said it again at the RP Opening that morning). I didn’t say anything then, though I could (and should!) show him an essay by Simon Leys, in which the author writes: “In debates, the word “quixotic” is nearly always meant as an insult – which puzzles me, since I can hardly think of a greater compliment…(He ends the article by paraphrasing Bernard Shaw) The successful man adapts himself to the world. The loser persists in trying to adapt the world to himself. Therefore all progress depends on the loser.” I still don’t know why I didn’t give Roger such an explanation (I really should!). I guess it sounds too intellectual; and I somehow think that an artist should avoid being too intellectual. I guess what I mean by “intellectual” is “being too logical and too reasonable”. Often I find that Intellectuals on TV talk in long sentences, they explain everything, and always tell you “what it should be”. With them, things become so exact (which is a good thing, it's their job to be exact and clear). Whereas, artists tend to express “what it is”, and “what it is” is always ambiguous. I think artists are fond of this uncertainty. Finally, I had to correct you on a small fact ( though I really wish you were right), I've only been pre-selected by the Threadandneedles, I haven't passed the final selection so far. Guess fingers crossed for this year! Many thanks again for the sweet article!